The Yanks are coming to town this summer, and we are going to see them! Matt won a chance to purchase tickets to a Red Sox vs. Yankees game. 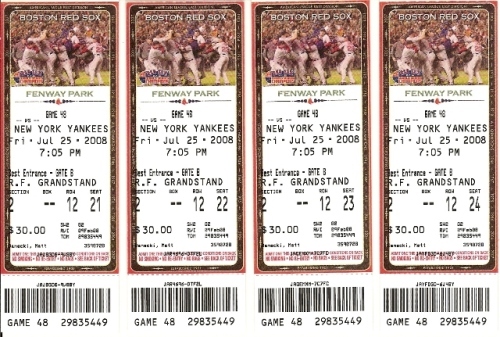 Each year the Red Sox have a drawing to give people a CHANCE to purchase up to four tickets for one of three different experiences, if your name is selected. One is to a Yankees game. Another is Green Monster Wall seats. The third is right field roof box seats. Matt and I entered this year and he was selected for the Yankees drawing. That meant he could go on-line and wait in a “virtual waiting room” while the system randomly selected people to proceed further and buy some tickets. Matt went on-line one Saturday at the 12:00 noon start, and waited. And waited. About six or seven hours later, he was finally selected to buy something. By that time, most of the better selections were gone, but he did snag four tickets to a July game in the grandstands. Check them out below. Since then, they held a green monster drawing which we did not get picked, and they have coming up the drawing for right field roof seats. We don’t expect to get picked again.